The House of Beaufort descended from the illicit union of John of Gaunt, Duke of Lancaster (1340 - 1399) and his mistress Katherine Swynford, the family played an important role as staunch Lancastrian supporters during the fifteenth century Wars of the Roses. The surname Beaufort derives from a castle owned by John of Gaunt in Champagne, now Montmorency-Beaufort. The family emblem was the portcullis which was later adopted by the Tudor dynasty, their descendants. After the death of Gaunt's second wife Constanza of Castille in 1394, Gaunt married Katherine in 1396, making her Duchess of Lancaster. Their children were legitimised by King Richard II and by Papal Bull, but barred from inheriting the throne. John of Gaunt was the third surviving son of King Edward III and Phillipa of Hainault. Katherine, who had previously been married to Hugh Swynford, was the daughter of Paon de Roet, a herald, and later knight. She had a brother, Walter and sisters Isabel, who later became Canoness of the convent of St. Waudru's, in Mons. Her other sister Philippa, a lady of Queen Philippa's household, married the poet Geoffrey Chaucer. Katherine outlived John by four years, dying on 10 May 1403. The eldest son of John of Gaunt and Katherine Swnford, John Beaufort served in the crusade of Louis II, Duke of Bourbon in North Africa and later was in Lithuania serving with the Teutonic Knights. After his parents' marriage and his subsequent legitimization John was created Earl of Somerset. His cousin King Richard II further created him Marquess of Somerset and Dorset in reward for the part he played in helping Richard free himself from the power of the Lords Appellant. Two days before his elevation to a Marquess, he was married to the King's niece, Margaret Holland, the daughter of Thomas Holland, 2nd Earl of Kent, who was the son of Joan "the Fair Maid of Kent" (granddaughter of Edward I and widow of the Black Prince). The marriage produced six children, Henry, 2nd Earl of Somerset, John, 1st Duke of Somerset, Joan, who became Queen Consort of Scotland, Thomas, Count of Perche, who fought in Henry V's campaigns in France, Edmund, 2nd Duke of Somerset and Margaret Beaufort, who became Countess of Devon. Following the deposition of King Richard II by John's half brother Henry Bolingbroke, who in 1399 assumed the throne as King Henry IV, John's further titles were rescinded, though he remained Earl of Somerset. He nevertheless, proved a loyal supporter of Henry IV and served in various military positions and on some important diplomatic missions on behalf of the king. He was granted the confiscated estates of the Welsh rebel leader Owain Glyndwr by Henry in 1400. The second son of Gaunt and Katherine Swynford, Henry Beaufort was born in Anjou in about 1374 and was brought up for a career in the Church. On 14 July 1398 he was consecrated Bishop of Lincoln . Following his usurpation of the throne, his half-brother Henry IV made Henry Lord Chancellor of England in 1403. Henry resigned his chancellorship a year later when he was appointed Bishop of Winchester. Henry lost the favour of the king through siding with his nephew, Henry Prince of Wales, against him. When the prince succeeded his father as Henry V, Henry was again appointed Chancellor. On the death of Henry V, Bishop Henry was appointed a member of the Regency Government which ruled during the minority of his young great nephew Henry VI. Bishop Beaufort was elevated to a Cardinal in 1426 by Pope Martin V. In 1427 Pope Martin further appointed him Papal Legate for Germany, Hungary, and Bohemia, and instructed him him to lead the fourth "crusade" against the Hussites in Bohemia. At the Battle of Tachov fought on 4 August 1427 during the Hussite Wars, the Cardinal's forces were routed. When Joan of Arc was captured by the English toward the end of the Hundred Years War with France, Beaufort presided at her trial at which she was sentenced to be burned at the stake. Cardinal Beaufort died on 11 April 1447 and was buried in Winchester Cathedral. Joan, the only daughter of John of Gaunt and Katherine Swynford, was probably born at the Swynford manor of Kettlethorpe in Lincolnshire. At the age of twelve, she was married to Robert Ferrers, 5th Baron Boteler of Wem at Beaufort-en-Vallée in Anjou. The couple produced two daughters before Ferrers died in around 1395. At the age of eighteen, the young widow was married for a second time to Ralph Neville, Earl of Westmorland, who had also been previously married. The marriage produced a brood of 16 children, among whom were Richard Neville. Earl of Salisbury (1400 - 1460), the eldest son of Joan and Ralph and a leading Yorkist supporter during the Wars of the Roses. Salisbury was killed at the Battle of Wakefield but became the ancestor of Anne Neville, Queen of Richard III and Queen Catherine Parr, the sixth wife of Henry VIII. Joan's daughter, Cecily Neville (1415 - 1495) known as the 'Rose of Raby', married the Yorkist claimant to the throne, Richard Plantagenet, Duke of York (1411 - 1460) and became the mother of the Yorkist Kings Edward IV and Richard III. Joan's numerous descendants also included Warwick 'the Kingmaker', the Dukes of Norfolk, the Dukes of Buckingham and the Percy Earls of Northumberland. Joan Beaufort died on 13 November 1440 at Howden in Yorkshire. She chose to be buried next to her mother, Katherine Swynford rather than her husband, in the sanctuary of Lincoln Cathedral. The tomb was damaged in 1644 by Roundheads during the English Civil War. The second son of John Beaufort, 1st Earl of Somerset and Margaret Holland, John succeeded his elder brother Henry as Earl of Somerset in 1418. He fought in the French Wars of Henry V at the age of seventeen. 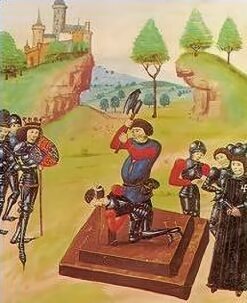 In 1421 Thomas, Duke of Clarence, Henry V's younger brother, was dispatched to fight against the dauphin of France in Anjou, Thomas advanced rashly against the French with his vanguard, and being surprised as he crossed a marsh, was killed. Somerset, who had accompanied him, was taken prisoner by the French. After being ransomed by the English, he continued fighting in France under King Henry VI. In 1443 John was created Duke of Somerset and Earl of Kendal, made a Knight of the Garter, and appointed Captain-General of Aquitaine and Normandy. He married Margaret Beauchamp of Bletso, daughter of Sir John Beauchamp in 1439. 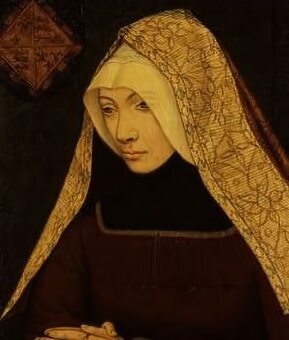 The marriage produced one child, Lady Mararet Beaufort (1443 - 1509) who in turn became the mother of King Henry VII, the founder of the Tudor dynasty. John proved to be a poor military commander and Richard Duke of York was preferred to him as regent of France. Somerset returned to England depressed by the situation in 1443 and died the following year, his death was rumoured to be suicide, as he was unable to brook the shame and disgrace of banishment from court. The daughter of John Beaufort, 1st Earl of Somerset and Margaret Holland, Joan was married to James I, King of Scots on 12 February 1424 at St Mary Overie Church in Southwark. James I of Scotland had been a prisoner in England since the age of 12 and was held captive for 18 years. He met the lovely Joan Beaufort at the English court and is reported to have fallen in love her. James was inspired by his love for Joan to write 'The Kingis Quair' an allegorical romantic poem. James was eventually released and returned to Scotland in 1424, accompanied by Joan. The marriage produced eight children, including James II King of Scots, known as 'James of the Fiery Face', due to a disfiguring red birthmark on his face. On 20 February 1437, conspirators supporting the rival claim to the Scottish throne of Walter, Earl of Atholl, secretly entered the Dominican Friary in Perth where James and his Queen were staying. James attempted an escape by climbing into a sewer that exited onto the tennis court, however, the outlet had been blocked the previous day to prevent the loss of tennis balls and the king was trapped and killed by his attackers. Joan, though injured in an attempt to defend her husband, managed to escape and fled to the safe refuge of Stirling Castle with her young son, now James II. Joan was appointed Regent of Scotland for her son until her second marriage in 1439 to James Stewart, the Black Knight. She died on 15 July 1455 while under siege at Dunbar Castle, and was buried in the Carthusian Priory at Perth. 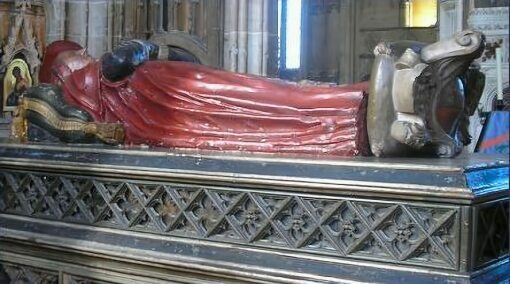 The third surviving son of John Beaufort, 1st Earl of Somerset and Margaret Holland, Edmund married Eleanor Beauchamp, daughter of Richard Beauchamp, 13th Earl of Warwick sometime between 1431 and 1435. They had 10 children, Eleanor Beaufort, Elizabeth Beaufort (c.1434- d. before 1472), Henry Beaufort, 2nd Duke of Somerset (1436-1464), Margaret Beaufort, Countess of Stafford (c. 1437-1474), Edmund Beaufort, 3rd Duke of Somerset (c. 1439- 4 May 1471), Anne Beaufort (c. 1453 - c. 1496), John, Earl of Dorset (c. 1455- 4 May 1471), Joan (c. 1447- d. 11 August 1518), Thomas (c. 1450-c. 1463) and Mary Beaufort (c. 1441). Edmund was involved in an intense personal rivalry with his cousin Richard, Duke of York. Henry VI created him Earl of Dorset in 1442 and Marquess of Dorset the following year. From 1444 to 1449 he served as Lieutenant of France, in March 1448 he was further honoured by being created Duke of Somerset. Much to York's chagrin, Somerset was appointed to replace him as commander in France in 1448. Fighting broke out in Normandy in August 1449 and Somerset's subsequent military failures left him vulnerable to criticism from York and his allies. He totally failed to repulse French attacks, and by the summer of 1450 nearly all of Henry V's conquests in northern France were lost. By 1453, all the English possessions in the south of France were also lost. In 1453, at the age of 32, Henry VI began to exhibit signs of serious mental illness. By means of a "sudden fright" he entered into a trance-like state reacting to and recognising no one. Catatonic schizophrenia have been suggested as a likely diagnosis. York was named Lord Protector of the Realm and imprisoned Somerset in the Tower of London. The king recovered his senses late in 1454, when York was forced to surrender his office. Richard of York, who possessed a slightly superior claim to the throne than Henry himself (through his descent from Lionel, Duke of Clarence, the 2nd surviving son of Edward III) was determined to depose Somerset by one means or another. In May 1455 he confronted Somerset and the King at the First Battle of St Albans which marked the beginning of the Wars of the Roses. Somerset was killed in a last wild charge from the house where he had been sheltering. His son and succesor, Henry Beaufort, the third Duke, bent on revenge, was never to forgive Warwick and York for the part they played in his father's untimely death. Henry Beaufort, the eldest son of Edmund Beaufort, 2nd Duke of Somerset, and Lady Eleanor Beauchamp, had fought alongside his father at the Lancastrian defeat at the First Battle of St. Albans in 1455, where he was seriously wounded and his father was slain. He was the principal commander at the Lancastrian victories of the Battle of Wakefield in 1460, in which both York and his brother-in-law and chief ally Salisbury were killed. In the Second Battle of St Albans in 1461, following the disastrous Lancastrian defeat at the Battle of Towton in 1461 he fled to seek refuge in Scotland. Somerset garrisoned several Northumberland castles but after surrendering to the Yorkists at the end of a siege, he indicated willingness to make peace with the Yorkist King Edward. Edward agreed to pardon Somerset and restored his forfeited lands and titles. Soon after, however, he travelled north again and began to raise troops for the Lancastrian cause. He managed to hold out in the north of England until May 1464, when he was defeated at the Battle of Hexham. He was taken prisoner in a barn at the site of what is now known as Dukes House, and beheaded by the Yorkists the same day. 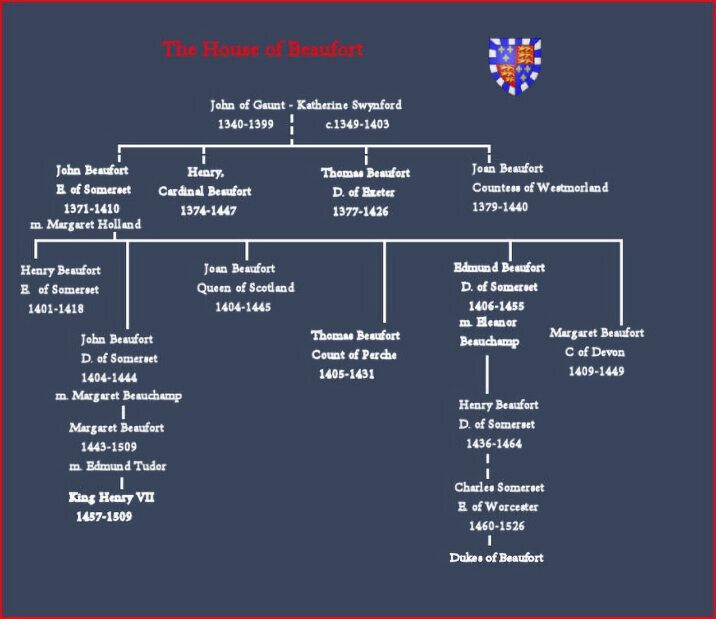 Edmund Beaufort was the second son of Edmund Beaufort, 2nd Duke of Somerset and his wife, Eleanor Beauchamp. In 1470, the exiled Lancastrian Queen Margaret of Anjou was reconciled with her erstwhile enemy Warwick the Kingmaker, who had been alienated by Edward IV's policies and his marriage to the commoner Elizabeth Woodville. These unlikely allies united in an attempt to restore her husband Henry VI to the throne. Their alliance was cemented by the marriage of Margaret's son, the Lancastrian Prince of Wales to Warwick's younger daughter, Anne Neville. Warwick invaded England and briefly reinstated Henry as king before meeting his end in combat with Edward IV at the Battle of Barnet in 1471. Beaufort, along with Queen Margaret and her son Edward, Prince of Wales, who had landed in England the day before Barnet was fought to learn the disastrous news of Warwick's defeat. They fled toward Wales to obtain aid from Jasper Tudor, Earl of Pembroke, the half brother of Henry VI. They were intercepted by a Yorkist army and forced to give battle at Tewkesbury on 4 May 1471. Somerset was given command of the Lancastrian right wing, and led a charge against the Yorkist left under William, Lord Hastings, which went unsupported by either the Earl of Devon or Lord Wenlock. This resulted in Somerset's force being driven back and suffering heavy losses. The enraged Somerset galloped back to the Lancastrian lines and rode up to the aged Wenlock, a former Yorkist, who commanded the centre, furiously demanding to know why he had failed to provide support. Without waiting for a reply, he split his skull with a battleaxe in his rage. Queen Margaret's son, the eighteen year old Edward, Prince of Wales, the last legitimate descendant of the House of Lancaster, was killed either in battle or during its aftermath. After the inevitable rout of the Lancastrian army, Somerset and other Lancastrian leaders claimed sanctuary at Tewkesbury Abbey, Two days later, Somerset and the other leaders were dragged out of the Abbey, and were ordered by Richard Duke of Gloucester and the Duke of Norfolk, Constable of England, to be put to death after perfunctory trials. 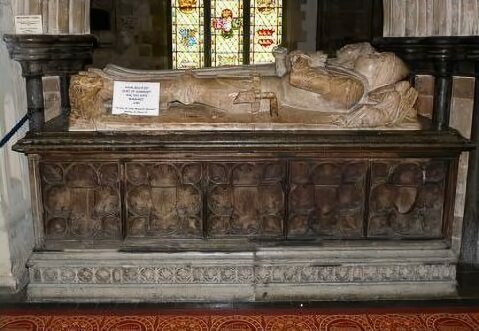 Edmund Beaufort, along with and his younger brother John Beaufort, Marquess of Dorset and Prince Edward of Lancaster who had both fallen in the battle, were buried at the Abbey. With the death of Edmund and John, the House of Beaufort became extinct in the male line, however their elder brother, Henry Beaufort, 3rd Duke of Somerset, left an illegitimate son Charles Somerset, 1st Earl of Worcester, (c. 1460 - 15 March 1526) who became the ancestor of the Dukes of Beaufort.